Picnic ideas and recipes. Whether it is a simple sandwich picnic or a fancy picnic, picnics in the summer time go hand in hand. Read our helpful picnic ideas, pack up your picnic baskets and make some picnic recipes the whole family will enjoy. Kids can get involved in preparing these recipes and packing the picnic basket. Pack your picnic basket with what you need 1st on top such as a tablecloth or silverware on top. Keep cold food cold and warm food warm to prevent spoiling. Don't place warm food in your cooler. Wrap the dish in towels. Store any uncooked food (if you are grilling) separately from cooked, prepared food. Packing cupcakes for lunch? Slice them in half and place the bottom of the cupcake on the frosted piece. That way, icing won't stick to your plastic bag. Freeze a few juice boxes to help keep things cold and for a cool drink later in the day. Place your food in zippered baggies and then on top of the ice in your cooler. This keeps food from getting wet once your ice starts melting. 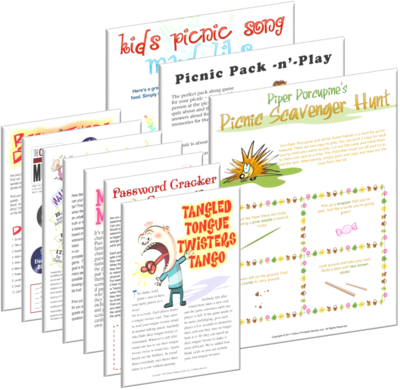 Take along some fun games to play whether it is a ball for catch or some printable picnic fun games. Grapes, watermelon cubes and strawberries on a skewer. Mix ingredients together and store in a plastic container for a picnic. You can omit onions or cucumbers or add differently vegetables such as chopped peppers or chopped radishes if desired. Chill several hours before the picnic and keep cool at the picnic. 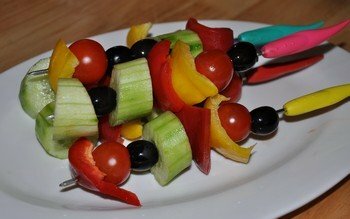 Serve with crackers or vegetables cut into sticks. Prepare this fresh salsa before the picnic and bring along a bag of tortilla chips. This is one of the easiest picnic ideas and recipes when you are grilling at the picnic. This will give everyone something to snack on while they are waiting for the food to cook. Chop ingredients finely, chop in the blender or food processor. Pour into a plastic container for the picnic. 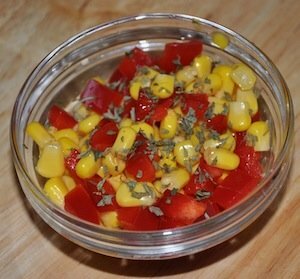 For a different salsa flavor try this fruity salsa. For younger chefs have an adult help with the chopping. Chop tomatoes, mangoes, cilantro and onion finely. Stir in lemon juice and serve with tortilla chips. In a saucepan cook pasta noodles until done. Set aside. Slice olives and chop tomatoes in half. Add both to a plastic container you will be using for the picnic. Add olives and cooked pasta noodles. Chop celery and add to bowl. Stir in tuna. Add mayonnaise, using more or less if desired, and stir until well combined. Chill in fridge and keep salad cool in cooler during picnic. Do any prep work needed for this recipe such as cook chicken and eggs and chopping vegetables. 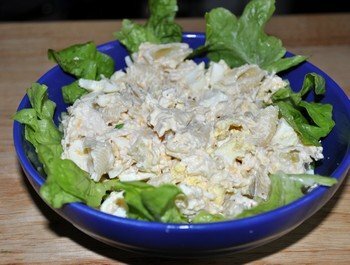 In mixing bowl add cooked chicken, celery, cheese, almonds, chopped eggs, and pickles. Stir ingredients together. In separate bowl add mayonnaise, salt, and lemon juice together. Mix well to combine. Chill in fridge and keep salad cool in cooler during picnic. Try this Quick Bean salad recipe. Toss into plastic bowl with a lid. Prepare dressing in a jar with a lid. Shake and pour over salad at the picnic. A sprig of mint will help with bees. A rotisserie chicken is an easy picnic recipe idea. Make a salad at home and stop at the store for a rotisserie chicken on your way to the picnic. Often picnic ideas and recipes include sandwiches but this time make it unique by bringing all the condiments, deli meat and sliced cheese with you to the picnic. Bring hoagie bread, tortillas to make wraps or pita bread. Let each person assemble their own. Bring one of the cold salad recipes below and your picnic can be easily put together in a snap. The day before your picnic or the night before your picnic place this in the crock pot and let it cook 8 hours on low. Shred and place in a plastic container. Bring along rolls and you have a pork sandwich ready to go. Place pork roast into baking dish or crock pot. Place onions on top. Combine remaining ingredients together to make barbecue sauce. Pour over meat. Cook in the oven for 1-2 hours at 350 degrees or in the crock pot on low 8 hours or on high 6-8 hours. Allow to cool slightly and shred meat. Serve on rolls. In a shallow dish or pie plate mix cracker crumbs, seasoning, paprika and pepper. In separate bowl mix together egg and milk. Prepare a baking dish by spraying the bottom. 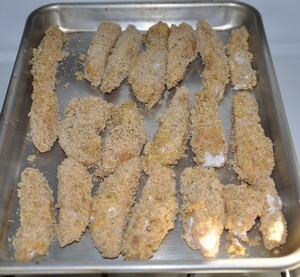 Dip chicken in milk mixture and then in crumb mixture to coat evenly. Place in baking dish and cook in a 350 degree oven for about 20 minutes or until chicken is no longer pink. If you would like to bring chicken warm, bake right before leaving for the picnic and wrap dish in a thick towel to insulate the heat. Otherwise allow to cool and store in plastic container for your picnic. Are you having a Barbecue or grilling? See our Barbecue recipes here that you can find more picnic ideas and recipes. Prepare cinnamon rolls the night before and bake in the morning before you go on a picnic. Find the recipe here with other breakfast recipes. Beat eggs and season with salt and pepper. Cook eggs in skillet in butter. As the eggs set, lift edges, letting uncooked portion flow underneath. When eggs are completely set, cut into four wedges. Prepare waffles. Make sandwiches out of 2 waffles with egg and bacon inside. Wrap each sandwich up in plastic wrap and take them along on your picnic. A fruit salad would be a great addition to any picnic breakfast recipe. Cook hard boiled eggs and bring them along for breakfast. They are quick and easy to take. A local waterway. Do a quick search of your local area to find rivers, ponds or lakes where you can paddle and swim safely and go on a reconnaissance mission to find somewhere with trees for shade and some grass for games. Get your child to help you pack up a picnic with plenty of drinks and aim to get there before lunch. Give the children an hour or so to splash in the water and then organize the picnic. After lunch, play some games in the grass or return for more water adventures. A ball game. If you live in or near a town where they play Major League, AAA or AA baseball, book some tickets for an afternoon game. Get your child to pack up some cold finger food and find somewhere that you can eat outside before the game. Some ballparks allow you to take food in and a few have dedicated picnic areas where you can sit under cover, eat and watch the game. A big city. For slightly older children, the thrill of a trip to your local big city is a special treat. Do some research about good places prior to your picnic, which might be a central park or a child-friendly museum. If you feel comfortable with your childs independence, set them off with some money and a cell phone and arrange to meet for a picnic lunch. You could also accompany the children to set locations. See these ideas for taking a picnic to the beach. To prepare for your picnic, discuss some easy picnic ideas and recipes with your child beforehand so you make items they enjoy. You can use this opportunity to teach them how to make their favorite dishes and inspire them to discover and try new foods. 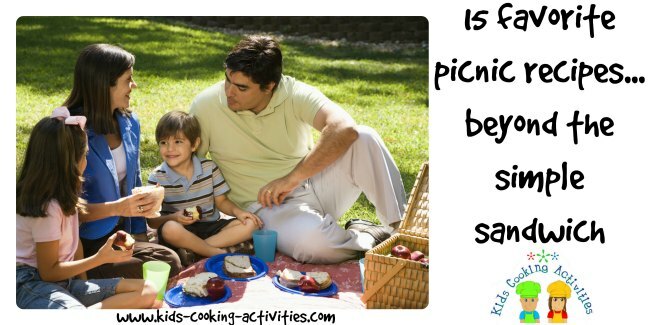 Create your own Picnic Recipes for Kids Page.